How did the Bushes, America's most powerful political family, become gradually seduced by and entangled with their Saudi counterparts? Why did the Bush administration approve the secret airlift of 140 Saudis, including two dozen relatives of Osama bin Laden, just after September 11? Did one of the Saudi royals on the planes have any advance knowledge of the attacks? What specifically chosen words did George W. Bush say on national television during the 2000 election campaign to trigger Muslim support? How did the Saudi-funded Islamic groups propel Bush to victory in Florida, thus winning him the presidency? The answers to these questions lie in a largely hidden relationship between the House of Bush and the House of Saud that began in the mid-1970s. An amazing weave of money, power and influence, it takes place all over the globe and involves war, covert operations and huge deals in the oil and defense industries. But, most horrifying of all, the secret liason between the two families helped trigger the Age of Terror and give rise to the tragedy of 9/11. Thoroughly enjoyed. Quite eye-opening and happy to have come across it. Oh what a tangled web we weave, when the Bush dynasty decides to decieve! I know George Bush likes to say "you're either for us, or against us", but who's side is this guy on anyway? Unger does alot of research to answer this question. The Bush family is so in bed with the oil-rich Saudis, you really have to wonder. If Congress ever decides to seriously investigate Bush actions before and after 9/11, House of Bush may turn into a house of cards. This book is a must-read before anyone casts their votes in the upcoming elections. Frightening read. It continues to amaze me that this administration continues to get away with so much that others would be prosecuted for. Until the press stops being cowed by this current administration, they will continue to get away with anything they choose. This book is quite an eye opener, and will make you think. The only problem I had with this is that I have alot less respect for the Bush family. I was already scraping the bottom with him anyway. I think the word is finally getting out about just how bad these people have been. IT IS ABOUT TIME. Great job on this book. Fascinating background to U.S. foreign policy in the Middle East, with plenty of references to date, time and sources of information. Highly revealing details about little known power brokers influencing American history. 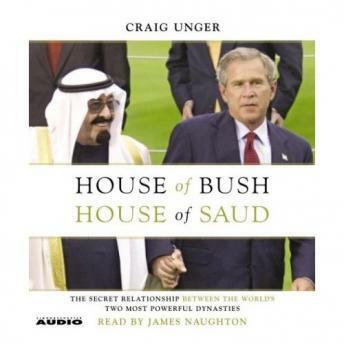 This book goes well beyond the documentary "Fahrenheit 9/11", which appears to have used "House of Bush, House of Saud" for much of its blueprint. Thought provoking, yet enjoyable. This book could have been more objective but nevertheless it was very interesting and thought provoking. A must read book. Well researched and well written. Excellent. Very thought provoking. I wish more of this information would be published in the mainstream media so that the general public could be more educated.